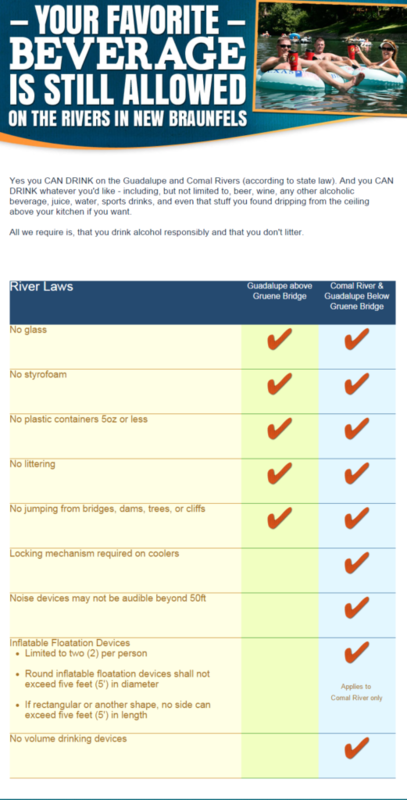 These are the 2016 New Braunfels River Rules. within the New Braunfels City Limits. Yes, you can drink on the Guadalupe and Comal River Tubing (this is in accordance with TX law) And you can drink whatever you’d like – beer, wine, mojitos, margaritas, fuzzy navels, any other alcoholic beverage, juice, water, sports drinks, and even that stuff you found dripping from under the hotel sink if you want. You may not crank up your radio so that it disturbs others, 50 feet noise ordinance in effect .